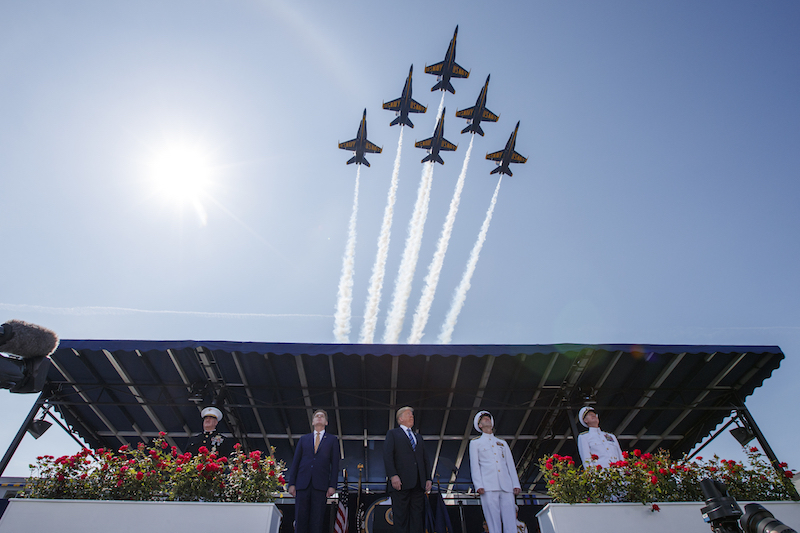 By Louis Jacobson, Amy Sherman on Friday, May 25th, 2018 at 1:03 p.m.
President Donald Trump’s May 25 speech at the commencement ceremonies for the U.S. Naval Academy included several incorrect or misleading statements. Speaking to graduating Naval Academy seniors, says "we just got you a big pay raise, first time in 10 years." "We’ve just secured -- you’ve read all about it -- a $700 billion (defense budget increase), the largest-ever amount of money to support our great war fighters." The percentage increase for those two years is large by historical standards, but it’s not the all-time record holder. If you combine the base budget and overseas operations, which is the metric Trump used in his speech, the defense budget is set to rise by 11.3 percent in 2018 and 10.7 percent In 2019. That’s a smaller increase than several other recent presidents. President Jimmy Carter increased military spending by 25 percent in 1981, while President Ronald Reagan added another 20 percent the following year. President George W. Bush boosted the defense budget by 27 percent in 2003, by 13 percent in 2007 and by nearly 12 percent in 2008. Trump fares a bit better if you just look at the base budget. Counting just the base budget, defense spending is set to rise by 14.6 percent in 2018 and by 15.1 percent in 2019. Those increases are higher than any single-year jump since 1977 with two exceptions. In 1981, President Ronald Reagan hiked the spending cap by 24.9 percent, and followed that with a 20.4 percent increase the following year. If Trump meant to say that the military is set to spend more raw dollars in 2018 and 2019, he has a point, but it’s a trivial accomplishment. Due to inflation and the nation’s increasing gross domestic product, the nation regularly sets new benchmarks in absolute amounts of defense spending. To make year-to-year comparisons, economists often use a different metric -- defense spending as a percentage of gross domestic product. There is no GDP data yet for 2018 and 2019, but here’s a chart showing defense spending as a percentage of GDP back to 1962. In 2017, the last year available, military spending accounted for just over 3 percent of GDP. By comparison, it ranged from 7 percent to 9 percent in the 1960s and was as high as 4.7 percent as recently as 2010. "We are rebuilding our defense industrial base to forge American iron, aluminum and steel -- which by the way we just put tariffs on when it comes in from other countries. We’re taking in a lot of money now, our country. They pay that big beautiful tariff, it goes right into rebuilding new ships." The proceeds of iron, aluminum or steel tariffs do not go directly into the rebuilding of ships. The proceeds flow into the national treasury, where they are spent on whatever Congress and the president agree to spend them on. "They pay that big beautiful tariff, it goes right into rebuilding new ships." "We have now the lowest number of ships that we’ve had since World War I. And very soon you are going to get to 355 beautiful ships, 355. That’s almost a couple of hundred more ships. So you will be around for a long time." Trump rehashes a talking point about the size of the naval fleet that doesn't tell you much about how the Navy does its job. Aside from that, he is exaggerating about the speed at which the Navy will receive "355 beautiful ships." It will not be happening "very soon." And it will not be "a couple of hundred more," as the Navy currently has 283 ships. Trump’s campaign promise to build a Navy of 350 surface ships and submarines continues to rate In the Works. The Navy has plans to expand its fleet, but it will likely take decades to get to 355. The Navy’s long-range ship acquisition plan submitted to Congress Feb. 12 stated that it planned "to reach a 355-ship fleet by the early FY2050s, potentially quicker with an aggressive investment of resources." "There is no ‘very soon’ about growing the size of the Navy," said Todd Harrison, a defense analyst with the Center for Strategic and International Studies. Trump’s statement that the 355-fleet "has been approved" doesn’t tell the full story. The 2018 National Defense Authorization Act stated that it "shall be the policy of the United States to have available, as soon as practicable, not fewer than 355 battle force ships." "I would argue not what most people consider to be ‘very soon,’" said Steve Ellis, vice president for Taxpayers for Common Sense.